do you recall the mallow cookie creme pies that i made quite recently? whelllll! those peanut butter cookies were made with this very homemade peanut butter recipe. first ya take the peanuts and a crunch em, ya crunch em. nah nah. just throw em in the food processor, silly! so easyyy, my people! 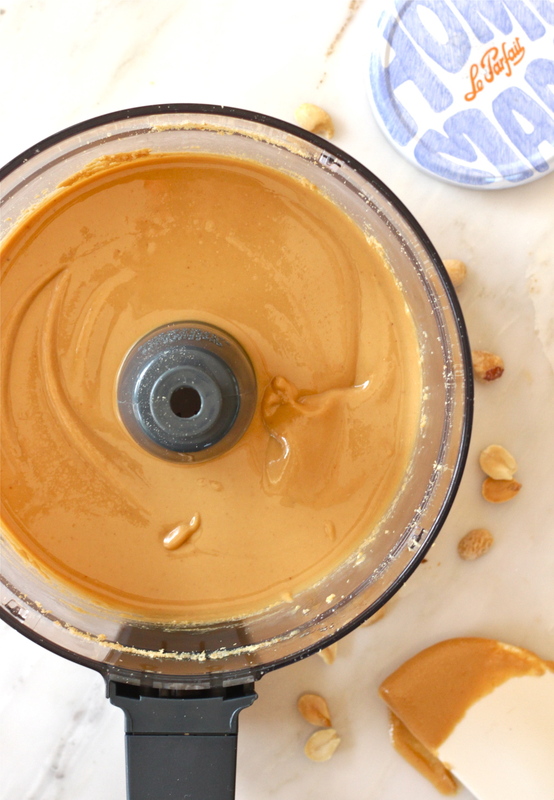 i think creamy peanut butter will still be the only nut butter i won't hesitate to buy at the store (because they make it so dreamy & delicious), but every other nut butter i tells ya...make it at home if you can. bling blinggg! i dunno why bling bling but i haven't said that since like 1999 and i've randomly said it about 3 times this week. peanuts are cheap! like, they're the actual unit that people use to measure cheapness - peanuts!! "they're payin' me peanuts!" so yeah, make those peanuts into peanut butter and save some dough, y'aaall. bling bling. Place the peanuts in a food processor. Run the processor for a few minutes, then scrape down the sides with a spatula. When the peanuts begin to form a thick texture, add the salt and coconut oil. Run the food processor for another few minutes until it looks very creamy* & shiny. Scoop all the peanut butter into an airtight container or jar and store in the fridge. *Note: Homemade PB will be just a little bit grittier than store-bought creamy PB. How doo they doo it?! Add to toast, smoothies, sandwiches, fresh fruit, yogurt, spoonfuls of chocolate chips, ice cream, lalalalalaaaaa peanut butter rulez. aloha triple nut skillet cinnamon rolls. alooooha. i suppose i've had hawaii slash any tropical vacation on the brain lately :) pete and i recently had a cinnamon roll that we could have sworn had coconut in it. i don't think it actually did, but it gave me an idear! hawaiian style cinnamon rolls. all my life i've put cinnamon rolls on this mental shelf of "too much work" or "can only buy them in a restaurant or a store." everybody always seemed to talk about how time consuming and how hard they are to make. i've been wanting a damn cinnamon roll lately, so i looked at a recipe and was like....well this looks easy. if you have all the time in the world (aka a saturday with zero plans), you can make them! the only time consuming thing about them is that you have to let the dough rise for two hours, and then after the rolls are complete and sliced up, they need to sit and rise for another thirty minutes or so. this means, you can go outside for at least two and a half hours during this INTENSE cinnamon roll making process. haha. i wandered about the house, stared at the mountains, spray-painted some old planters, tested out pete's new seat belts in the volkswagen, looked at a magazine. the point is, they are not difficult to make at all! you could easily make the dough in advance if you needed to, roll it out when you're ready, throw on your toppings, roll it up, slice, and bake baby bake. not only was this the first time i have ever made up my own recipe for baking, it was the first time in my whole life making cinnamon rolls from scratch. don't fear the cinnamon roll, people. i used coconut milk and coconut oil instead of regular dairy and butter, and the dough turned out just as moist and delicious as regular cinnamon rolls, and with a delightful hint of coconut! i guess i could have called these "quadruple-nut cinnamon rolls," but that might be overwhelming and make everyone want to run to the hills. i knew for sure i wanted the classic walnut in the recipe, because they are cinnamon roll staples, and because i said so! also, i bought literally 23 macadamia nuts from the bulk section because i know they cost an arm and a leg and didn't want a whole container...i pulled that lever down oh so gingerly. macadamia nuts for extra hawaiian vibes. finally, something about the flavor of a hazelnut i just couldn't exclude from this nutty party. so hazelnut made the cut for no reason other than i like them a lot. i know a lot of people do not like nuts in their foods/desserts and things, but you don't have to use any of these if you don't want to! i just like them for texture and extra hints of different flavors. oooh ombre nuts. so trendy right now. i only used 1/4 cup of each type of nut. i went easy on the hazelnuts because this particular batch i had were kind of stale. bumma. i don't actually know why i added chocolate. maybe because i was making my own recipe and getting crazy in the kitchen with all the freedom. i think i was worried the rolls would be dry and this was my attempt at giving them extra moisture. turns out the chocolate was probably too much and i would leave it out completely the next time i make these. it was surely delicious, just a bit too rich and overpowered the cinnamon. the dough wasn't dry at all. dry dough crisis averted, and lesson learned. you could cut these into thinner rounds if you want to have more cinnamon rolls without doubling the recipe. i cut them into random widths because i'm a first timer and i didn't know what i was doing. i baked them in a skillet just for the hell of it. i did find that the roundness of the skillet allowed the butter in the bottom of it to gather and collect in all the nooks and crannies of the rolls instead of retreating to the corners like in a square baking pan. peter referred to this effect as "good bottom caramelization." i would agree. go for the skillet! i wanted to keep the glaze as light as possible since the cinnamon roll innards were going to be pretty rich, but you could use whatever icing or glaze you like. i even tried heating plain greek yogurt with vanilla extract. don't do that. unless you like sweet & tart rubbery curds of dairy on your baked goods that clog the sink drain. this is just powdered sugar, coconut milk, and very light vanilla and coconut extracts. the rolls be bakin'! pause to gaze at these pink flowers and pretend you're laying in a breezy porch hammock listening to the waves crash on the beach. voila. the rolls didn't explode or disintegrate, and i didn't burn the house down! great success. and, guess what? they tasted good! i think i actually liked these better on the second day. the dough stayed moist and all the flavors had some time to jive. my mother uses that term for flavors coming together, which i like a lot more than "meld" or "integrate." mingle is a good word, too. and they're cute, to boot. Warm 1 cup of coconut milk in a sauce pan. Transfer to bowl of stand mixer or electric mixer and add melted coconut oil and packet of yeast. Stir with a spoon, and let sit for 15 minutes until foamy/bubbly. Slowly begin adding the flour in small portions, unless you enjoy poofy clouds of flour in your eyes and cleaning tables and walls. Add the egg, vanilla, and salt. Mix on low until combined with paddle attachment. Switch to the Captain Hook attachment, and continue to mix on low and add the last of the flour. If the dough seems a little dry or looks flaky, add 1 TB coconut milk and continue to mix. Knead for 5 minutes on low. Oil a medium/large sized bowl with butter/cooking spray/coconut oil. Place the dough in this bowl and cover with a warm & wet kitchen towel or paper towel. Let sit on the counter for about 2 hours. Go outside. Do whatever you want for 2 hours. Come back to find a plump risen ball of dough. Yay! That's what you want to see. You're pretty much almost done at this point even though you've done practically nothing. Chop all the nuts and chocolate and set aside. In a small bowl, stir the brown sugar and cinnamon mixture and set aside. Clean a large surface of your counter or tabletop. Flour the surface enough to cover so that the dough won't stick. Remove the dough from the bowl and begin kneading it on the clean surface with your clean hands. Flatten out the dough and roll into a large rectangle with a floured rolling pin (or wine bottle!). My rectangle was approximately 18 x 12 inches and 1/4 inch thick. I used a melted mixture of butter and coconut oil to brush the dough all over once it was all rolled out. Sprinkle the brown sugar & cinnamon mixture all over. Sprinkle the nuts and chocolate all over. Roll it up, pup! Try to keep the roll tight so that the bits of filling won't fall out everywhere. Slice the roll with a sharp floured knife into 1-2 inch sections. Liberally butter/oil/grease the inside surface of your cast iron skillet. The more the merrier caramelization. Carefully place all the cinnamon rolls into the skillet, giving each one a tiny bit of breathing room so that they're easy to separate later. Cover, and let them rise for 30 more minutes inside the skillet or baking dish. In a medium bowl, whisk all the ingredients for the glaze. Whisk, whisk, whisk! It will become smooth after looking perpetually lumpy for a few minutes. Preheat the oven to 350 degrees (F). Place skillet in oven on center rack. Bake for 25-30 minutes. I kept mine in for 30 minutes until I saw the top getting golden brown and the dough looked set. Eat 'em with milk or coffee or the complementary beverage of your choice. Kick your feet up! You've just made cinnamon rolls from scratch and it wasn't as scary as everybody always told you. and mahalo. my first real life, big kid recipe. written down with words and actual measurements. milestone.